We recently visited new housing complexes in cities around Hangzhou, where prices have been reported down 30%. In Xuzhou, Changzhou, and Ningbo, as well as Hangzhou, we generally found asking prices down by 20-30% and transactions very slow. Some developers that had sufficient cash resources were simply holding their property off the market and not transacting. 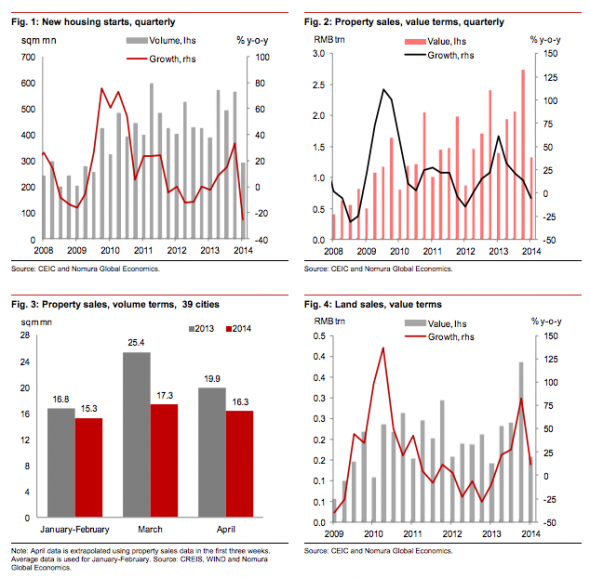 We have found the same trends in the Northeast, and China Securities Net reported this week that, in April, prices for housing in Changsha, Hunan fell 30%, while transaction volumes were down 60%. Our base case forecast notwithstanding, we think the risk of a sharper and more persistent property downturn has increased. 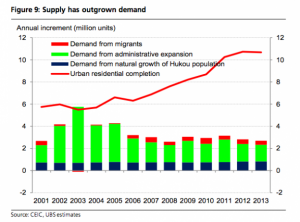 Construction has increased more rapidly relative to underlying demand in the urban area, shifting market balance compared to a few years ago. 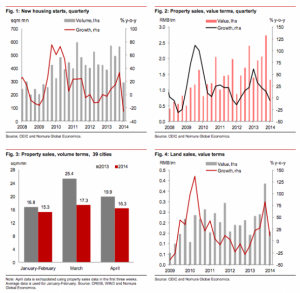 In the meantime, as financial sector reform and capital account opening continue, and as property prices stay stagnant, the case for property as an investment vehicle will become increasingly weak. The shift in asset preference and market sentiment may not be as easily offset by government measures as before, considering the changes already happening to the balance between supply and underlying demand. Moreover, following the post-global-financial-crisis property and infrastructure boom and given the already high overall leverage, we think the room and effectiveness of policy support may be limited compared with 2009-10. We see a 15% probability that a sharp property downturn could lead to GDP growth dropping to a 5% handle in 2015. For example, on infrastructure, while railways and public transport still have a lot of room to grow, the much larger sector of highways and roads does not. On social housing, while the speed of construction can be accelerated, programs in the past few years have already resulted in a big increase in the share of social housing in overall construction, accounting for 15% of ongoing construction and a quarter of urban residential completion (figures 17-18). It is not clear how much faster it can grow from this high base. In addition, local government finance would likely be significantly hurt by a property downturn, limiting its ability to carry out ongoing infrastructure projects, let alone its ability to increase infrastructure and social spending. Land sales have accounted for about a quarter of overall local government spending in recent years (budgetary spending + government fund spending). Also, a significant portion of local government borrowing may have been collateralized by land and property as well – local government debt has increased by almost Rmb10 trillion since 2010. Therefore, there is a sizable and growing risk that the government’s measures may not be sufficient to stabilize property activities and overall investment, as investment demand for housing changes significantly and developers cut their construction more aggressively, which could aggravate difficulties at the local government level. In such case, demand for heavy industry products would drop notably, leading to a decline in investment and consumption growth. We think there is a 15% probability that the property downturn will be much more severe than we envisage now, leading to GDP growth slowing to about 5% in 2015. That pretty much sums up my view, though I see the risk of it getting nasty at more like 50% and the downside more like 4% growth, a rebound and then permanent Western levels of growth. Slowing is the objective of reform not its enemy. Slowing is not the objective at all-retention of Party power and privilege is the objective to which re- balancing comes second. That complicates analysis somewhat and creates substantial uncertainty. Slowing secures Party power if the alternative is running off an economic cliff. Especially if that slowing also involves a transfer of national income to households and away from the elite, which was my point! If you have a crash or even a modest slow down in housing – you cannot have a positive GDP number. That is mathematically impossible. The most interest recent comment was by Mr Mao of Vanke when he noted that a recent release of 5,000 low cost housing units received 250,000 applications even while shifting the high cost product was proving more difficult. Clearly, as we would expect, there is still plenty of demand for housing that is modern but affordable to low income earners. The problem may simply be that it is not possible to produce new housing that meets the peasants price point without large public subsidy. Nothing wrong with that as we still haven’t mastered the art of producing new Commodores that are affordable to people on pensions without a large public subsidy. But it may mean, as our housing construction industry discovered, that there is a unresolvable mismatch between the price of new houses in China and the capacity of the average factory worker or peasant to pay. Of course our mismatch is largely self inflected with tick box gold plated optional extras requirements by local council and a “first user pays all” approach. Ironically, the developers haven’t been making the right houses (a command economy without planning!). Does this mean they will begin building such low-cost houses? If so, is there a Europe in the offing? A fairly drab Europe if they are building to a price point of 3-4 times the median peasant annual income of $US6000. I think a 20k flat is probably about right!!! Are those $20K flats the liquidation price or the price for a newly constructed flat? Houston does have lots of $15-$20K flats. Most are humble 2 bedders built in the 1980s. I suspect that the average Chinese factory worker or peasant might find it more affordable to buy a 30 year old 2 bed room unit in Texas. That sounds bizarre but may also explain why buying a flat in Australia is also an attractive option. Some of the prices of new apartments in China seem incredibly high considering the average earnings. Command economy in Australia too, for housing ! – Exactly the same as inner suburban melbourne, where development except for 1million dollar large homes, 2 per block, has just been banned. Nothing affordable is permitted to be built – no townhouses, large apartments, high rise. City High rise are empty, bought by foreign investors only. (and maybe to be sold soon). If you are paying 20 times earnings for an investment flat in China/HK then 9 times in Australia must look like a bargain. How dare they deny corrupt officials their right to hide money in property! Thanks BS, that reference was my pleasure. Why is the worst case scenario still 4-5% growth? Why not negative growth as happened in every other country that went through a construction boom-bust cycle (e.g. the US, Spain, Ireland)? It’s definitely getting interesting, all the regional governments need a continuous stream of RE development/sales to fund their chronic budget deficits. Not to mention the fact that RE development is one of the major employers of so many migrant workers. Hmmm wonder if the migrants are returning to their villages? Nov-Dec 2008 was a really scary time in many of these remote villages because so many returned to their homes without work, without money, but with all the dysfunction and emotional baggage that comes with their itinerant lifestyles. Normally speaking these guys only appear in their villages for Chinese New Year and they come with enough money (and beer) to see them through. I’m told the real problems surface when the money/beer runs out. The real problems? Read somewhere(probably here) that there’s lots of little uprisings getting knocked on the head in rural areas. Are these serious, organised things or just folk who have had a gutful and have bricks handy? If you’re talking far western China then there are lots of smallish uprisings against the government by the largely Muslim population. However there are far more social problems resulting from land claims and water management and lifestyle choices all over the rest of China some of this is directed at the gov’t but imho most is interpersonal. In many of these villages families own plots with largely informal / historical agreements about water rights and access. Well when all the young leave the farm (as happened in late 1990’s and 2000’s ) leaving the farm to be run by grandma/grandpa they dont tend to care about their water allotments or their excess farm land, so what was a small but commercially viable farm becomes subsistence agriculture for most and a big farm (often cheaply leasing others excess land) for some. OK so when the itinerant laborers return (after 10 years or more ) they have to face up to a new reality, grandma leased the farm, someone rerouted most of my water, there is now no local market for my produce, so I grow. Problems problems problems which means lots of squabbles. If their farm was anywhere near the major towns than parts of it have probably been confiscated by various local govt’s. ALL these problems came to a head back in late 2008, additionally many of the itinerant workers arrive back home with drinking problems and emotional baggage, they may be married for 10 years but they’ve spent less then 1 year total living with their wife and they find they dont like what they see, or more often the wife does not like what she sees. I read a joke one time that Golden week had to be one week because if it were ever extended to two weeks then all these underlying social problems would boil up to the surface, so apparently everyone can remain cordial for one week but by the end of the second week they’d have riots. 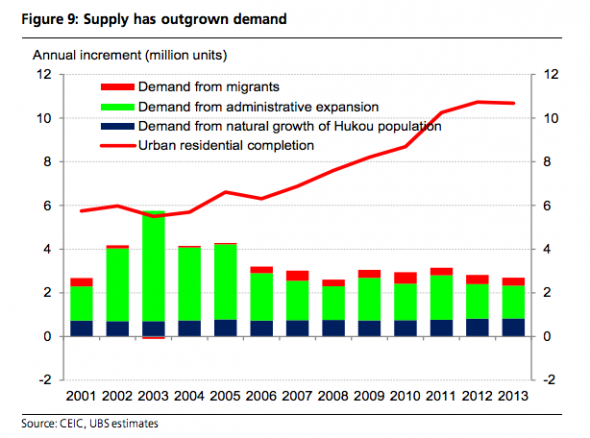 All this is why China hit the stimulus button so hard in early 2009, it wanted the workers back at the construction sites and back in the factories and order returned to the countryside. This policy worked wonders and the infrastructure boom was born, its a classic can kick, solves nothing just delays things hopefully long enough that something new takes the place of infrastructure and eventually everyone forgets about the old farm. Good to see can-kicking is the national sport everywhere. Which is why it is not possible for the local govts to subsidise the cost of housing that is built to a price point inconsistent with the incomes of the average worker. They are dependent on higher prices to fund their operating budgets. It is one thing to have a large potential for urbanisation but it still has to occur at a rate the country or more specifically the likely buyers of urban apartments have the resources to support. As we know, even in Australia, there is sluggish demand for new houses costing $400k-$500k 40 km from the nearest CBD, even with our highly advanced debt peddling system. The second graphic is not able to be viewed fully. +1. Please fix the link to the developer finance charts.